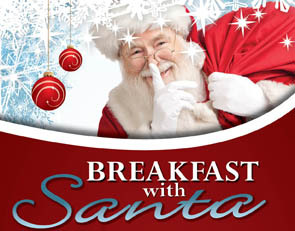 Join us for a pancake breakfast, children's crafts, and see Santa Claus! The City of Menlo Park Community Services Department will be hosting the annual “Breakfast with Santa” on Saturday, December 5th, 2015 from 7:30am - 11:30am at the Arrillaga Family Recreation Center located at 700 Alma Street. Activities will include pancake breakfast, letter writing to Santa, holiday crafts, visiting and picture taking with Santa, and a fun time with friends & family. Reservations are required and are available online starting November 1st. $1.00 OFF ticket price with donation of an unwrapped toy for the Fire Fighter Toy Drive. To reserve tickets online please click on the provided link and select the option for "Events and Concerts". From there you can scroll to the top of the page and purchase tickets for children and adults.